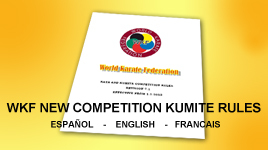 For the Championships in Madrid this year, those who participate in the Referee Course and pass examination will be able to officiate in the World Championships as confirmation event. Those who do not pass will only be authorized to do so in the case they show the necessary 2PL + 1SA in 3 continents in 2018. For those officials going to Madrid for the license renewal (written examination), they will be able to do the renewal, but will only be able to officiate the Championships if they have participated in 2PL + 1SA in 3 continents during 2018; the same for 2019. Officials that want to do the license renewal in 2020, have to officiate in the 2019 World Championships (not applicable when it is the confirmation event after passing the referee course examination). For 2021 and onwards in order to be able to do the license renewal, Officials have to participate in at least 1 World Championships after the last license renewal. We are confident that these measures will allow us to keep the top quality required from all of us and as an Olympic sport we have the vocation to stay in the Olympic Games beyond Tokyo.